Premium Osteopathy Treatment table by Seers Medical. 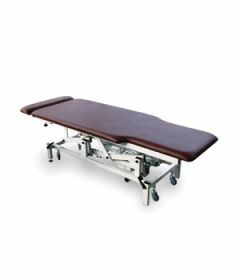 The V-210 osteo table is a classic 2-Section treatment and osteopathy table with a 6" Slider, a strong, rigid construction designed for longevity and constant heavy use, and an anti-bacterial impregnated upholstery to protect against microbial or fungal growth including salmonella & E coli. It can also double as an electric hi-lo massage table. For assistance in choosing the most adequate fixed height treatment table for your practice, call 1-800-561-0310.